We caught the Valentine’s Day virus. Great salad. I really love the combination of the romaine and beets with pomegranate vinegar. 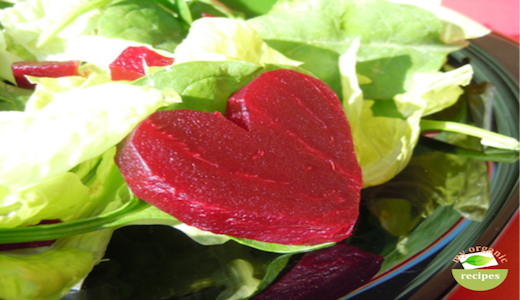 Steam the beets and cut them into heart shapes. Rinse the lettuce under cold running water. In a large bowl of ice water place the lettuce to crisp for 10-15 minutes. Drain well and dry in a salad spinner. In a salad bowl combine the lettuce and the beets. Add the olive oil, pomegranate vinegar, salt and pepper and toss with the salad. Note: you can add more vinegar or olive oil as you wish.